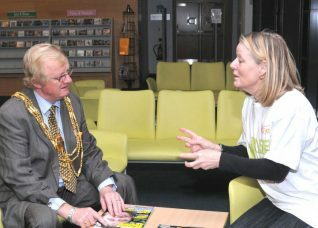 Vistors to the Jubilee Library this week were given a rather novel ‘book’ borrowing opportunity. The books in question were actually ‘people on loan’. Visitors to the event could choose a ‘living book’ and then listen to that person’s experiences and ask them questions. The volunteer ‘books’ were people that many of us may not meet in our everyday lives, and about whom we may have prejudices and misconceptions or simply curiousity and questions. The theme of the event was Living With Violence and brought together local people who have either directly been affected by domestic abuse or who work with survivors or perpetrators. Domestic abuse is, by its nature, a hidden and complex problem and the Living Library was a chance to speak to those involved personally and professionally. Rise stands for refuge, information, support and education. Rise was founded in 1994 and, until 2008, known as the Women’s Refuge Project. Rise supports women, children and young people in Brighton & Hove and West Sussex who are affected by domestic abuse. Rise services include crisis accommodation, helpline, counselling, support groups, legal and housing advice and children’s services.